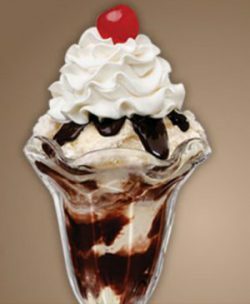 A luscious and scrumptious Happy Ending Sundae is yours free on your birthday at Friendly’s. What’s better than having your cake and eating it too? Eating your cake every day of your birthday month, of course! Now you can, thanks to free birthday dessert coupons exclusively available from your favorite restaurants. Scoring a free birthday dessert is pretty straightforward: simply signup in advance for the restaurant’s e-birthday club and you’ll be emailed a dessert coupon to redeem for your birthday. Some restaurants require you to redeem the coupon on the day of your actual birthday, but most allow you to cash in for a free dessert any time during your birthday week or month. Wondering where you can get the biggest slice of cake, a frosty birthday shake, or delicious chocolate glazed doughnut? You’re in luck: we’ve compiled a list of the top 10 free birthday desserts. All you need to do is join the restaurant’s birthday eClub. Love Arby’s slow-roasted roast beef, turkey and premium Angus beef sandwiches? Be sure to save room for dessert! Enjoy a free birthday small shake with any purchase. Choose from classics like the chocolate or vanilla shake, or spice things up with a limited time shake special, like the mint chocolate swirl shake. Can’t decide between chocolate or coffee? Get both with the Jamocha Shake: it’s a frosty shake filled with chocolate and coffee goodness, and the perfect, refreshing taste for your birthday celebrations. Arby’s small shake coupon is good for seven days. Who can resist a freshly baked Auntie Anne’s soft pretzel coated in cinnamon sugar goodness? Whether you’re a fan of sweet or savory flavors, you’ll get exactly what you want on your birthday with a free pretzel coupon. Choose from original, cinnamon sugar, sweet almond, sour cream and onion, roasted garlic and parmesan, pepperoni, jalapeno, and raisin. Use the Auntie Anne’s My Pretzel Perks app to redeem your birthday pretzel offer directly from your smartphone. Bring your best friend along for the celebrations (or just stock up for yourself): the Dairy Queen birthday offer is a Buy One Get One special on Blizzards. Choose from classic creations like the Oreo Cookie Blizzard Treat and the Reese’s Blizzard Treat, or up your Blizzard game with a “Royal” choice, like the Royal Rock Road Brownie Blizzard Treat. Personally, I’ve got a weakness for the Peanut Butter Cookie Dough Smash Blizzard and the Chocolate Chip Cookie Dough. Good thing I can have both! Offer valid for two weeks; 7 days before/7 days after your birthday. Keep reading for our pick for number 10 , a free bundlet. 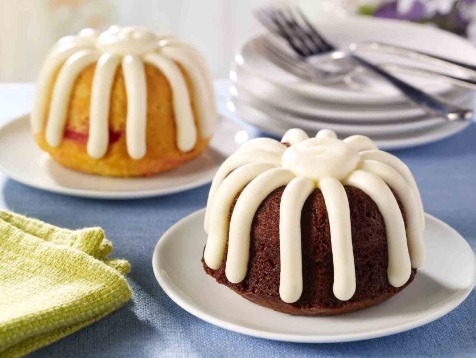 These mini single-serving cakes are the perfect birthday indulgence from Nothing Bundt Cakes. Happy Birthday from Club Cinnabon! Chill out on your big day with a free MochaLatta chill drink, a chocolatey drink with a coffee kick. Pair with a fresh order of cinnabon stix for the perfect mid-morning pick-me-up or sweet afternoon indulgence. It’s your birthday– you deserve it! Offer valid for 10 days. What’s more classic or refreshing than a free birthday Italian water ice? Whether you crave a fruity flavor like guava or honeydew, a blast of summer with pineapple or pina colada, or love the indulgent taste of chocolate-chocolate chip (yes, that’s two chocolates), your favorite Rita’s flavor is yours for free on your birthday. Offer valid for 7 days. We can’t think of a sweeter way to celebrate your big day than by enjoying Friendly’s famous Happy Ending Sundae on the house. Whether you’re indulging in a platter of birthday pancakes, a classic lunch treat like Friendly’s grilled cheese sandwiches, or visiting with friends for a celebratory round of dessert, nothing tops the meal off like a Happy Ending Sundae. If you’re out with friends you may need an extra spoon! They’ll definitely want a bite of those two scoops of chocolate, strawberry topping, and fluffy whipped cream. A very happy ending to your birthday meal, indeed! Offer valid for 60 days. Don’t just have a birthday cake– have a birthday cookie cake! The Great American Cookie company will give you a FREE slice of cookie cake with the purchase of any regular soda. While the offer is valid for two weeks after your birthday, you’ll need to bring along your photo ID so the team knows that it’s you. Life is just better with a birthday cookie! Offer valid for 14 days. Powdered or glazed? Crème filled or jelly filled? If you’re a doughnut fanatic, you can have it your way on your birthday at Krispy Kreme. Start your birthday celebrations off right with a morning treat: one free doughnut of your choice PLUS a small Krispy Kreme coffee or fountain soda. Stuck working on your birthday or dealing with a difficult boss? Save your doughnut coupon for a much-needed mid-afternoon pick-me-up. Offer valid for 14 days; 7 days before/7 days after your birthday. Start your birthday morning off right with a free bakery item. Panera’s freshly baked treats include blueberry scones, cinnamon rolls, and fluffy muffins. Panera’s baking team arrives early (sometimes as early as 3am!) to start rolling out the dough and baking delicious goods fresh each morning. You can taste the difference! Redeem the Panera birthday offer on your birthday and up to 50 days after! We couldn’t make a list of the top 10 birthday dessert freebies and NOT include a cake! You could say that the Nothing Bundt Cake giveaway really does “take the cake” – have a happier birthday with a free bundtlet, no purchase required. These mini single-serving cakes are the perfect birthday indulgence. Made from only the purest ingredients including real eggs, real butter, and real cream cheese, you’ll love the thick signature frosting petals that adorn your free bundtlet. A very happy birthday to you, indeed! Offer valid for 14 days. Want more birthday freebies? Here’s our comprehensive list of restaurants that offer free birthday meals. Start planning the celebrations today! For the best free birthday breakfasts, lunches and dinners see Top 10 Free Birthday Meals. Learn how to get coupons for free restaurant meals all year long, see Free Restaurant Meals Strategy Guide.